Many cat owners do not realize that in their pets too, as in humans, can be problems with teeth. Of course, they decay extremely rare, but the plaque - the main problem. It arises from the fact that in nature predominantly cats eating solid food bite bone and soft modern feed may not provide sufficient cleaning of the teeth of the stone. 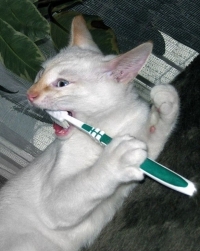 Therefore, the question arises - whether it is possible to brush your cat's teeth? Specifically, not only possible but also necessary - to not only provide the necessary oral health of the animal, but also to avoid occurrence of tartar, which leads to the destruction of enamel. There are several ways to clean your cat's teeth. Tooth powder and a children's toothbrush with soft bristles. The most important thing - to act carefully so as not to damage the gums cat. Do not use toothpaste for people - it is harmful to cats. It is better to buy a special (eg, flavored fish) to the pet store. If in doubt whether to use a toothbrush - so as not to cause the cat pain, just do it with your finger, wrapped with a soft material. Soda and red wine (you need to use the cheapest). Before you brush your cat's teeth of gruel of soda, wipe it with a cotton pad soaked in cheap wine. Vinegar contained in the wine reacts with the soda and effectively removes tartar. There is also a special liquid toothpaste, it is most easy to use - simply dissolve one spoon of pasta in a glass of water and give it to the animal. This is the best option if the mechanical cleaning of the teeth in cats does not suit you - for example, if your pet is not in any consent to the procedure. Do not insist - that you only spoil your's own nerves and the cat's. Instead of a liquid paste (or with it) is included in the diet of an animal solid feed, which will be a natural way to clean his teeth, or just occasionally offer him a chew bone with some meat. Teach to brushing his teeth gradually, so as not to cause him stress. Optimally carry out this procedure every 1-2 weeks, and then, when the cat gets used, go to 1-2 times a week (as recommended veterinarians). Do I need to brush cat's teeth more often? If your cat has no problems and great tartar, no. But if the problem is serious - it makes sense to do it every day. If you just found out that cats need to brush your teeth, and tartar much covers the entire surface - contact vetkliniku to remove it with ultrasound. Just like people, animals carry out this procedure, and it is very effective, especially in severe cases. It is absolutely harmless and painless, as the specialist selects the optimal amplitude and frequency fluctuations, which makes it easy to remove the stone and not damaging the tooth enamel. Ultrasonic cleaning teeth for cats is usually performed without anesthesia, provided that the animal is calm and behaved aggressively. In addition to getting rid of tartar and malodor, dental cleaning avoids many intestinal diseases, as the bacteria are removed irrespective of whether cats teeth purified by conventional means or by ultrasound. Even if your pet eat solid food or raw meat - do not neglect cleaning, no harm will not bring it anyway. In order to determine the optimal frequency of the procedure, it is best to contact your veterinarian, who will examine the animal and determine the condition of the oral cavity. Some cats are intolerant to brushing their teeth, no matter how patiently you are trying to train them. In such cases, it is necessary to use other means to prevent the appearance of plaque on the teeth of cats and tartar. If the cat eats soft (wet or canned) pet food, add to his diet the dry food, it can reduce the tendency to form plaque and tartar. However, be sure to consult with your doctor about suitable feed your cat. There are special dental toys (bone, dental chews) for cats, which clean the teeth. They are produced with different scents and can be useful to reduce (but not prevent) the layer of plaque and stone. The veterinarian will tell you the best option. If the cat does not like the process of brushing teeth and toothpaste like, you can try to add the pasta to dry food or to put it on the toy that he fell on the cat's teeth. For cats developed drugs with chlorhexidine (antiseptic, allowing to control bacteria in the mouth) in the form of a liquid or gel. They also reduce the amount of bacteria in the cat's mouth, although long-term use can lead to discoloration of the tooth enamel. A veterinarian can prescribe special food for cat's dental that are designed to remove plaque and tartar. Of course, regular home cat's dental care does not guarantee that sooner or later you will not have to see a doctor for dental care. However, it significantly improves cat's dental health pushes the start and reduces the severity of possible diseases.